This mesmerising and suspenseful novel examines isolation, trust and the vagaries of memory. Ruth Field and her cats reside in a house set among the dunes on the New South Wales South Coast. Ruth is a widow who lives a self-contained life, her hours and days filled by watching the sea from her favourite chair, picking occasionally at the meagre contents of her pantry. Early one morning, she is awakened by noises in her living room, sounds she’s certain are being made by a tiger. 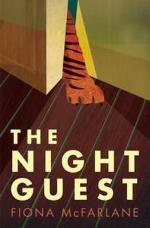 It is the beginning of an unusual day for Ruth, for though she finds no trace of a tiger in her house, she receives an unexpected visitor, Frida, who climbs the unstable dunes outside Ruth’s house with a suitcase and a no-nonsense attitude; she has been sent by the government to take care of Ruth for a few hours each day. Freed from the concerns of her own life, Ruth begins to retreat further into her memories, particularly those of her childhood in Fiji and her first love, Richard, and soon the boundaries between the present and the past blur. The house took to Frida; it opened up. Ruth sat in her chair and watched it happen … The house and the oranges and Ruth waited every weekday morning for Frida to come in her golden taxi, and when she left they fell into silences of relief and regret. Ruth found herself looking forward to the disruption of her days; she was a little disgusted at herself for succumbing so quickly. MacFarlane’s talent shines in the taut, slow-burning suspense that forms around Ruth and Frida’s everyday life, thanks to Ruth’s unreliable memory and general uncertainty, and Frida’s careful manipulation of her employer to suit her own needs. ‘And remember, we talked about George, all my trouble with George? And you said I could stay as long as I needed to. So here I am.’ Frida spread out her hands as if her definition of I included not only her body, but the objects surrounding it, and in fact the entire room. ‘That isn’t true, Frida, what you’re saying to me now, it’s not true. I’d remember.’ Ruth was certain, but there was a feeling of unravelling, all the same; an unwound thread. This suspense is tempered by the gentle humour that suffuses the novel, the genuine tenderness Frida shows the vulnerable Ruth and McFarlane’s enchanting voice. White sheets discoloured with age ‘spread out and tucked in … reminded Ruth of well-buttered bread’; after 50 years, the beauty of Ruth’s first love, Richard, looks as if it ‘had been tucked away – politely, resolutely – so that he might get on with the rest of his life’; the sky reddens, ‘the tiniest drop of blood stirred in water’. This is a quiet book; much happens under the surface, just beyond Ruth’s reach, making it difficult to determine the truth of her relationship with Frida. Part of the book’s beauty lies in this uncertainty, as the reader’s distance from the story allows assumptions to be made and suspicions to form, but McFarlane’s characters behave in unexpected ways, challenging our expectations. The result is a skilful study of ageing and loneliness and an exploration of our own beliefs about those who choose to care for the vulnerable members of our society.